The gooseneck barnacle differs from other barnacles (acorn, ...) in that they have a flexible extension ("neck") that increases their reach from their fixed location on their rock. 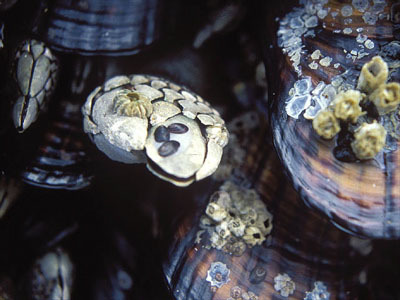 They are commonly found living near or amongst California mussels. The cover plates of this gooseneck barnacle is inhabitated by another type of barnacle and several juvenile limpets. These young limpets will feed by grazing on a film of algae that forms on the surface of the larger barnacle.